For composer, producer, and session guitarist Jason T. Miller, time crunches are just part of the job. Inspired by his father, TV and film composer and arranger Bruce Miller, the younger Miller has assembled a strong track record as a songwriter and record producer, including co-writing and producing tracks for Grammy winners Kanye West and Keyshia Cole and co-writing a song for Reba McEntire. He also has wielded his axe at many a session-while still in college at UCLA, he earned numerous accolades as a guitarist and played on an episode of Frasier and on the CBS comedy Becker. Miller also does a lot of scoring for television and commercials, including spots for Honda, Pizza Hut, Kay Jewelers, and many more. With TV work, especially, the clock is ticking, and he needs to work fast. 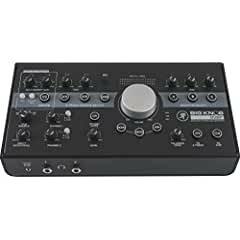 That's where his Mackie Big Knob Studio+ Monitor Controller/Interface comes to the rescue. "The Big Knob Studio+ is the cornerstone of my studio setup," reveals Miller. "When scoring for television, time crunch is usually an issue. You get an episode to mix, and you have to deliver in two days. You have a lot of people waiting for the finished product, and if you don't deliver, you're out of a job. It has got to be done right and quickly the first time..."